Miracle baby Clera and family survived Solomon Islands floods. A mother’s joy of giving birth to her healthy baby girl turned into a fight to save her daughter’s life. Only a week after returning home from hospital with her new bundle of joy, Madeline Hiro, found herself desperately trying to save her family from the raging waters that took their family home during the recent flash floods in Honiara. She now joins 52,000 people who have been affected by this disaster that has also claimed the lives of at least twenty-one people, many of which were children. The Panatina Pavilion is actually a multi-purpose hall at Solomon Islands National University that is now one of the largest evacuation centers in Honiara - home to more than 2000 people who lost their homes and belongings as a result of the recent flash floods. 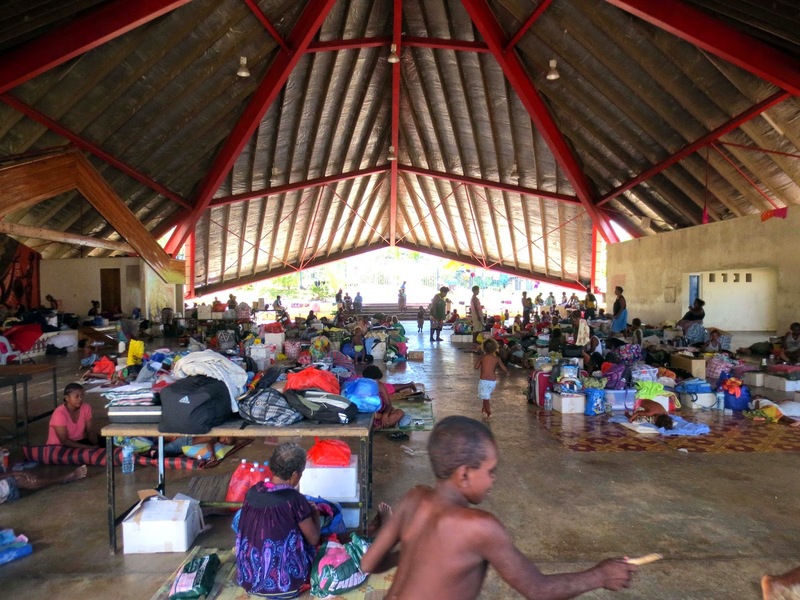 There are now about twenty-four evacuation centers in Honiara housing more than 9,000 people. The strain on evacuation centers and its facilities continue to be exacerbated with the issue of overcrowding. Access to food, water and proper sanitation continue to be major concerns in many of these evacuation centers. “When I gave birth to my daughter, Clera, I didn’t think that in less than one week of having her with us at home, that my family would lose everything,” said Madeline as she led me to her family’s little corner just a few feet away from where we stood. And there she was. Precious little Clera, the youngest of nine siblings, now sound asleep oblivious to all the commotion and chatter happening around her in the crowded evacuation center. UNICEF Pacific yesterday afternoon provided 300 collapsible containers, soap and purification tablets to Caritas for distribution to evacuation centers through the WASH cluster and three large UNICEF tents have also been handed over to Ministry of Education. Two emergency health kits equipped with medical supplies and medication that can cater for approximately 20,000 people arrived into the country this week. These health kits will be handed over tomorrow (Saturday) to the Ministry of Health with one to support Good Samaritan Hospital and the second to be provided to Honiara City Council. UNICEF Pacific in close partnership with Oxfam, Save the Children, World Vision together with ADRA and Safenet in support of the Solomon Islands National Youth Council, Ministry of Education and Human Resource Development and Ministry of Youth, Children and Family Affairs have been working to provide technical support through the Protection Cluster. UNICEF Pacific is also working towards establishing learning centers with activities for children in evacuation centers and is ready to dispatch more WASH kits, collapsible containers, tents and other supplies in addition to the ongoing support for urgently needed assessments through the various clusters. Although many people have already started leaving evacuation centers, many more still remain without a place to go. The concerns of overcrowded evacuation centers is an urgent priority particularly as the likelihood of outbreaks of diseases due to poor access to clean water, inadequate hygiene facilities continues to increase. Food is also a major issue and efforts are being made by all relevant stakeholders to ensure that supplies and assistance is provided to those affected.